Planum has had a relatively long life. Conceived in 1997 at a meeting of directors and editors of the main European journals dealing with urban planning at the time and promoted within the II Biennial of European Towns and Town Planners that took place in Rome, the journal released its first issue in 1999 thanks to European financing from DG XIII Ten Telecom. The "About" tab on the website's home page states that "Planum was the first European www and on-line journal entirely devoted to the planners and to the whole community of people involved in city development and the protection of the environment". Since then, Planum, designed as a free-access portal and initially a review of European journals, was modified in form and structure. This was done, first, to be able to tap into processes that affected digital publishing, and specialized publishing in particular, over this pan of time; and second, to represent the substantial change that regarded the disciplinary field in the same time frame. Even its name was changed in 2011, from Planum - The European Journal of Planning on-line to Planum - The Journal of Urbanism, with a desire to mark the change in the disciplines that deal with cities and territories and their international hybridization, evident in the establishment of a new term such as urbanism. The accelerated dynamics that simultaneously affected the means of communication and its object necessitated flexible publishing activity that was not always aligned with the standards progressively being seen for scientific products and their channels of diffusion. The editorial choice has always been to favour the substantial role of cultural and scientific exchange, without overindulging in academic rules. This choice was made possible by Planum's ownership (the Istituto Nazionale di Urbanistica [the Italian Planners Institute]) and the ad hoc constitution of an Association for its management. Beside its founding members, the Planum Association has included a variety of ordinary members and supporters, maintaining its voluntary nature. 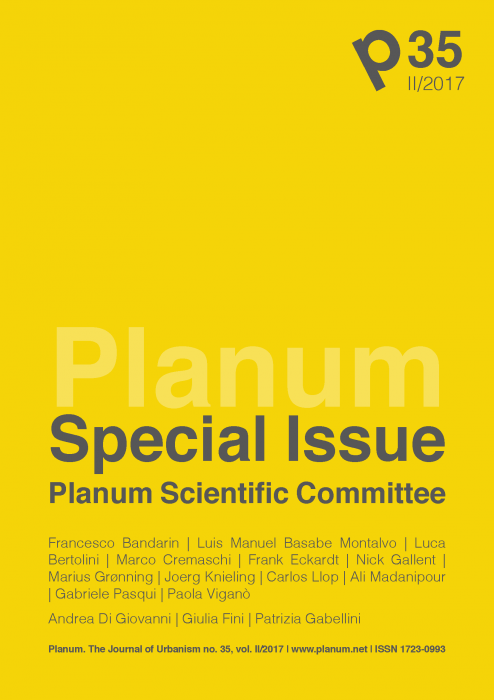 The life of Planum and its dynamics are also indebted to the work of young editors that have had the capacity to mobilize and motivate many collaborators. Continuity in key roles of editorial coordination and a succession of collaborators and interns, today natives of the web, are essential aspects of its resilient nature. Over the years, the most important modifications have led to the formation of (Ibidem), dedicated to reviewing texts, and Planum Publisher, dedicated to publishing and enhancing editorial projects. This special issue completes the path of building a real magazine with the formation of a Scientific committee. The sections and an archive of some relevant paper journals (covers and indexes) and contributions that number in the thousands, some of which are decidedly excellent, still distinguish the portal. The decision to create a Scientific committee arose as a response to the need to build a network of exchange that favours a flow of contributions that sufficiently represents the research and study interests cultivated today in the different contexts. For this reason, Professors with different scientific profiles have been invited to take part. They are located at numerous European schools of architecture and planning and play important individual roles in international research networks. It seemed useful to present these committee members to the many readers of Planum in their role as scholars, researchers, and designers, authors of texts that have marked and still mark important paths of reflection in the numerous disciplinary fields that nowadays are called urbanism. A collection of contributions therefore emerges, defined by Andrea Di Giovanni as "not designed, but not by chance, either", precisely because they reflect the reasons underlying the formation of the panel of authors. My hope is that this special issue of the Magazine attracts our readers' interest and, perhaps, solicits other contributions. Particular thanks goes to the colleagues that have willingly accepted to take part in the Scientific committee and to participate in building this issue. • Wildgarten Quartier in Wien. • What is the Fjord City? • Urban-Rural Partnerships as a Tool of Territorial Cohesion. A Conceptual Approach derived from INTERREG IV C URMA "Urban-Rural Partnerships in Metropolitan Areas"
• Ciudades, territorios metropolitanos y regiones urbanas eficientes. Estrategias y propuestas de proyecto para la regeneración dela Ciudad Mosaico Territorial después de la explosión de la ciudad.